Take the greatest music from the most influential years in pop history and combine it with six veteran professional musicians who have a passion for it and what do you get? 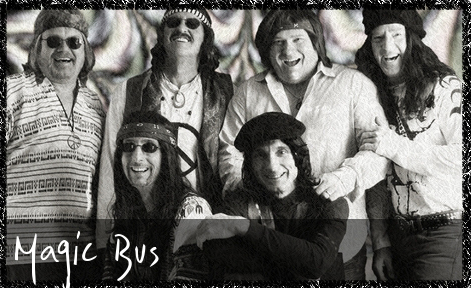 "Magic Bus“ "The Experience”. From the moment the stage smoke starts billowing out and you hear the beginning of Jimi Hendrix’s “Star Spangled Banner” to the flower power feel of The Youngblood’s “Get Together” you instantly feel transported back in time to the Haite Ashbury district of San Francisco in the late 1960”s. Suddenly it’s the “Summer of Love” and you’re there! Peace signs, Headbands and all! The Band’s colorful, authentic costumes and Hippie like approach only serve to further the already enjoyable journey your about embark upon. A journey through the years that created some of the greatest hit songs of all time! You will also be hard pressed to find any musical group short of the "original artist’s" performing more accurate versions of these great songs. Their 30 year combined musical portfolio consists from performing at The Palace of Auburn Hills and Meadowbrook Music Theatre to opening act for such groups as Tommy James and the Shondells, The Rascals, The Spinners. These are musicians who have worked at every level of the industry and understand what it takes to create a rock solid professional act that will leave an audience excited and wanting more!